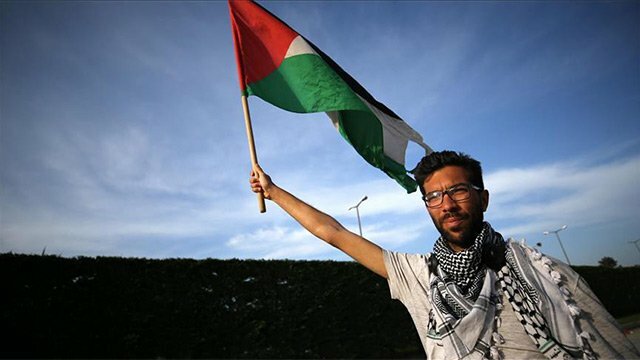 A 25-year-old Swedish activist, who commenced a long walk from Sweden to Palestine to raise awareness about human rights violations in the occupied territory, reached Turkey’s northwestern Duzce province on Sunday. Benjamin Ladraa crossed Germany, Austria, Slovenia, Croatia, Serbia and Bulgaria to reach Istanbul last week. Ladraa was in Duzce on Sunday. He will continue to walk through Syria and Lebanon to reach Palestine. “If I can’t get into the Palestine, I will try to inform the media about it," he said. Ladraa pointed out that he was so moved by a three-week trip to Palestine last year in April that he decided to "tell the world about the situation in Palestine". "I was shocked by what I saw there […] soldiers walking along the streets carrying M-60 machine guns. After three weeks I returned and wanted to do something to raise awareness about human rights violations in Palestine," said Ladraa, who was born to Jewish parents. "Palestine issue is not a religious. The main problem is human rights. Not just Gazans but all Palestinians are under pressure and they all suffer. That’s why I’m trying to catch the world's attention towards the pain of the people," he added. Now almost eight months in to a journey, his aim has been to draw attention to the occupation of Palestine and inspire more people to campaign for change. He posts pictures of his journey on his Facebook and Instagram accounts with a hashtag #WalkToPalestine. Ladraa will arrive in Turkey’s capital Ankara in a week. He is expected to complete his journey by June or July.